The theory that bacteria hasten our death has been questioned by research suggesting living in a sterile world would not boost life expectancy. It has been thought that the immune system response provoked by even harmless bacteria speeds up the ageing process by using up vital energy. But a study of fruit flies kept in a bacteria-free environment showed they did not outlive their grubby siblings. The University of Southern California study appears in Cell Metabolism. The question is, if it's not bacteria that limit life span, then what is it? The researchers admit their experiment cannot be replicated in higher organisms, which need bacteria for proper digestion and other functions. But they said the result in flies still may be relevant to human ageing research. 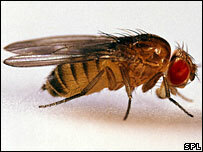 In both flies and humans, the number of bacteria living on the organism increases with age. The innate immune response to bacteria is similar in flies and humans, and it loses strength with age in both species. But the study suggests these factors may have nothing to do with ageing. Lead researcher Dr Steven Finkel said: "I think a lot of people would just assume that if you're increasing bacterial load in an ageing human, it must be bad. "It might not just be bad, it just might be. Prior to this study, I would not have thought that." His colleague Dr John Tower said "It's a surprise. "Even though the flies were accumulating so much bacteria and a robust immune response to that bacteria, it's not limiting how long the flies live. "The question is, if it's not bacteria that limit life span, then what is it?" The researchers compared normal fruit flies to specimens born from eggs washed in antibiotic, raised in an axenic (bacteria-free) environment, and given disinfected food throughout their lives. A third group of flies was raised with bacteria and disinfected in adulthood. Samples taken from the flies throughout their life confirmed that the axenically-grown flies stayed free from bacteria, while bacteria counts in the normal flies increased dramatically at they got older. But all the flies lived for approximately three months. Lorna Layward, of the Help the Aged biomedical Research into Ageing Programme, said the study was interesting. But she said: "Humans don't live in a world free of infection - we are bombarded with bacteria every day of our lives. "We know that the older we become the more vulnerable we are to infection. "Our immunity declines with age, and with an increasingly ageing society, it is important that we research ways to improve the ability to fight infection."